Summary: On the afternoon of November 4, 2013, Sasha, a white agender teen, and Richard, a 16-year-old African-American boy, ended up on the same Oakland bus. For reasons that remain unclear, Richard used a lighter to set Sasha’s skirt on fire as they were sleeping. The results were third-degree burns on Sasha’s legs and arrest for Richard. 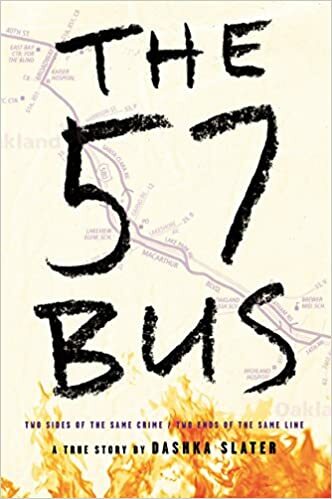 The 57 Bus traces the stories of the two teens, the events that brought them to that fateful day, and what happened to each of them afterward. It was a hate crime without the hate, a spur-of-the-moment, unthinking prank carried out by a boy who believed he had a good heart. Friends, parents, and teachers share their experiences with Sasha and Richard, and readers will learn that the distinctions between male and female, victim and criminal, and good and evil are not always as clear as they may seem to be. 320 pages; grades 7+. Pros: So much to think about and discuss in this story. Dashka Slater (who also wrote this year’s beautiful picture book The Antlered Ship) doesn’t flinch from looking at both teens’ stories, but also is compassionate in her descriptions. Richard could have been portrayed as a monster, but instead he emerges as someone who is as much or more of a victim, born to a single teen mom (who seems pretty awesome), raised in poverty, and facing prejudice in the criminal justice system. He shows strength and maturity as he carries out his sentence, and I found myself rooting for a happy ending for him as much as Sasha. Cons: I’m on the fence about whether to get this for my middle school library. Aside from the subject matter, the f-word is sprinkled throughout, as well as other language. You think they haven’t heard the F-word?? Do your middle school kids a favor and buy the book! Thanks, [Keep Calm, Carry On, Poster, Keep Calm and Travel On, Keep Calm and Carry On, Blue 5×7″] “Do not read, as children do, to amuse yourself, or like the ambitious, for the purpose of instruction. No, read in order to live.” –Gustave Flaubert Currently Reading Refugee by Gratz. Thanks, Debbie. As a relatively new middle school librarian, I still struggle with what’s appropriate in a library that serves 11-14 year olds. But I do agree that there are many middle school kids who would benefit from reading this book.